​How do you tell the difference between squirrels and chipmunks? What are the differences between them, and does it really matter? ​If you've ever wondered about any of these things . . . or more, you're in the right place! ​How Long Do They Live? ​How are They as Pests? ​Do Squirrels and Chipmunks Get Along? ​Do Squirrels and Chipmunks Mate? ​Squirrels and chipmunks are both members of the squirrel family – Sciuridae. Prairie dogs, woodchucks, and marmots are all in the squirrel family too. 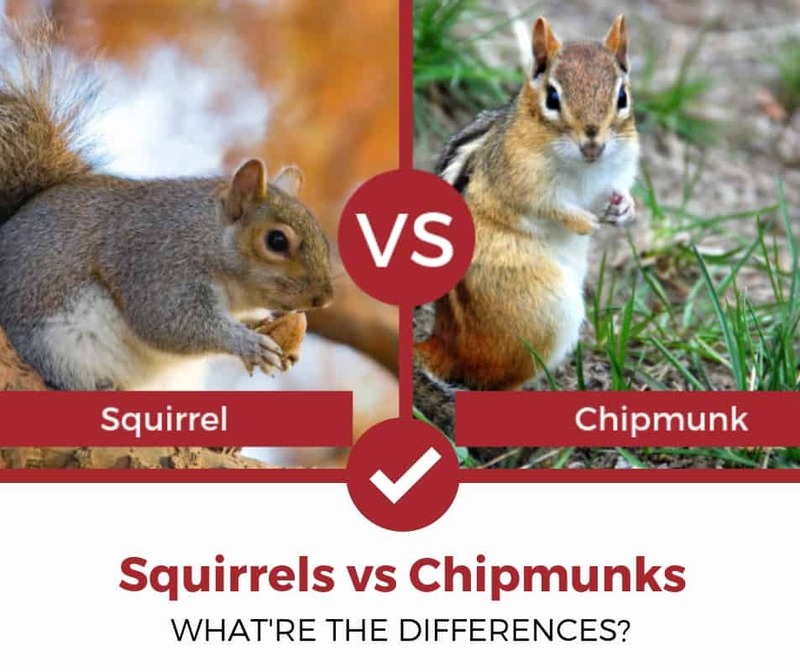 Although squirrels and chipmunks are closely related, there are some significant differences between them. ​The most common variety of squirrel in North America is the gray squirrel. They're typically grayish rather than actually being gray. Their coat is a mixture of blacks, whites, and browns. They generally grow to around 18-20 inches long and around a pound-and-a-half in weight. Chipmunks are tan colored with five very prominent black or dark-brown stripes running down their sides and back. They have light-colored underbellies and brown feet. ​Chipmunks grow to 8-10 inches, usually on the smaller end of the scale, and weigh around 2-1/2 to 4 ounces. Their markings are very distinctive; you'll never mistake them for a squirrel. ​Squirrels can survive quite handily in forests, open woodlands, parklands, suburban settings, and even densely populated urban environments such as New York City. Squirrels usually live in holes left in trees by woodpeckers, expanded them as they see fit. Their nests are packed with twigs, leaves, moss, and other materials. They prefer to live high up in trees. Chipmunks on the other hand, live in woodland, parkland, suburban, and urban areas the same as squirrels. However, their optimal habitat is deciduous woodlands that contain a lot of stumps and logs. ​Chipmunks typically live in burrows in the ground, some of which can become a complex system of tunnels and food storage areas. They usually have a central nest, filled with leaves and moss. Read more: Click here to learn more about chipmunks. ​The primary diet of most squirrels is “mast” (the fruit and nuts of trees). They prefer acorns from oak trees, nuts from beech tree, hickories, etc. ​Squirrels eat other types of food such as mushrooms, flowers and buds, plant shoots, and so forth. They don't hibernate and remain active all winter. Instead, they rely on their fat reserves and cached “mast” stores to survive the cold season. Chipmunks, on the other hand, are omnivorous. They'll eat just about anything, including garden vegetables, berries, fruit, roots, corn, seeds, and mushrooms. They'll also eat insects and earthworms, snails, bird's eggs, frogs, salamanders, and small snakes, young birds and mics. From mid-summer to October, chipmunks gather as much food as they can, storing it in their burrows. Although they don't hibernate the way a bear does, they do go into a state of torpor, fluctuating back and forth between sleep and grogginess when they eat their stored supplies. ​Squirrels mate twice a year - once around January with a litter born sometime in March, then in May or June with the litter born in July or August. ​A third mating may take place when food is particularly abundant that year. Chipmunks have much the same mating cycle. ​Several factors affect the natural lifespan of both squirrels and chipmunks; food, predators, and weather. Squirrels are hunted by various snakes such as rattlesnakes and black snakes, as well as weasels, skunks, and foxes. They are especially subject to predation by hawks and owls. Only 1-in-4 survive their first year. After their 2nd year of life, an experienced squirrel can live for another 4-5 years, but none are known to have lived longer than 7 years. Age slows down their reflexes and they inevitably fall prey to some predator. Harsh winters that result in a shortened growing season can cause a drop in their available food supply, leading to starvation. Chipmunks are similar to squirrels in almost every respect in this area. The only difference is that they normally live for two to three years in the wild and five to eight years in captivity. ​Here's a short and rather amusing video that will show you how squirrels and chipmunks interact or compete with each other. Which is Worse? Chipmunks or Squirrels? ​Squirrels are many times more likely to be considered nuisances than chipmunks are. While chipmunks are generally considered “cute” – witness Alvin and the Chipmunks – they're not known for chewing through power lines, whereas squirrels are famous for it, although perhaps “infamous” is more accurate. Squirrels have caused so many power outages and blackouts in so many places even the New York Times carried an article about them one time. ​Let's say you are getting ready for work in the morning and hear a loud and quick "Bam! ", then a moment later the power will go out. All they can do then is sigh in frustration because the squirrel that did it is just bits and pieces of fur by the time they hear the explosion. ​Squirrels are notorious for eating all the birdseed people put out for birds. In fact, a whole cottage industry has sprung up to produce squirrel proof bird feeders. They're also known for invading people's attics. Chipmunks by contrast, generally don't do any of these things. They just stay outside looking all cute and adorable and posing for pictures. ​Typically squirrels and chipmunks ignore each other. Their dietary requirements and preferred habitat are different enough that they're not competitors for anything. They make their homes in different places so they're neighbors, but nothing more. It's uncommon to see squirrels and chipmunks run right past each other as if the other one was invisible. ​No. They barely deign to notice each other in passing as they go about their daily lives. Although they're both members of the Sciuridae family of rodents, they have so little in common there's really nothing to attract them or bring them together. ​Biologically, it's probably possible they're cross-fertile, but we can't find any evidence that anyone has ever tried to cross a squirrel and a chipmunk by artificial insemination. Why would anyone want to? ​Squirrels and chipmunks have more differences than commonalities, but there's no animus or hostility between the two species. From a human standpoint, the only important difference is that chipmunks are cute and harmless, while squirrels are kinda cute and a dadgum nuisance. Curious about other squirrel and chipmunk guides? Check out our other detailed guides to help you deal with your pest problems.